Be the first to share your favorite memory, photo or story of Argil . This memorial page is dedicated for family, friends and future generations to celebrate the life of their loved one. 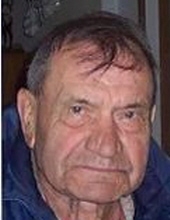 Argil Reubin Zabel (Archie) age 92, Clintonville, passed away peacefully on Sunday March 24,2019 at Manor Care of Appleton. Archie was born on February 16,1927 in the Town of Belle Plaine, Shawano County, to the late Herman & Hazel (Zimmerman)Zabel. In 1944 he became a serviceman for the U.S. Navy and served until 1946 when he was honorably discharged as a Yeoman Third Class. After returning from the military he became a CPA before joining the Wisconsin State Patrol. In 1948 he was united in marriage to Vivian LeBeau. Their union in marriage resulted in 3 sons and 2 daughters. After 13 years he left the State Patrol and was then employed at American Can (Georgia Pacific) until his retirement at the age of 60. Archie enjoyed hunting and fishing with his sons, trips to California, Canada, Washington State, picking asparagus and fresh strawberries and listening to the bi-weekly radio auction show. Archie will be remembered by family and friends for always thinking and helping others before himself. Archie is survived by his children: Ronald Zabel; Randall Zabel; Ricky(Lisa)Zabel; Lisa Schmitting; Stephanie(Dennis)Drewa; grandchildren: Brittany Drewa and Alex Zabel; Tiffany and Michael Collar; Monique Wilhelm and Jeremy Zabel; Jennifer Zehner, Christie Zabel Kaminske and Jamie Zabel; brother Duane “Butch” Zabel; sister in-law Marcy Zabel and brother in-law Ken Oltrogge. He is further survived by numerous great grandchildren,nieces,nephews, other relatives and friends. Archie was preceded in death by his parents, brother Rodney, sisters Ramona Oltrogge and Willadeen Much, great-grandson Devin Wilhelm and mother of his children Vivian Zabel. The family would like to send out a special thank you to Manor Care of Appleton for all the care and concern they have shown for Archie. It was Archie’s wishes that no Funeral services be held. A private Burial will be held at Woodlawn Cemetery, Shawano. Should friends desire, contributions may be sent to 117w 10th st Kaukauna,Wi 54130. To plant a tree in memory of Argil Reubin Zabel, please visit our Tribute Store. "Email Address" would like to share the life celebration of Argil Reubin Zabel. Click on the "link" to go to share a favorite memory or leave a condolence message for the family.